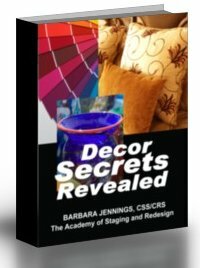 "I am recently divorced and would love to be able to start a business such as staging or restaging. Do you believe it would be possible to earn much money doing this in the St. Louis area? We have a large number of homeowners from all income bracket levels. Do you discuss adding new furnishings to a home that does not have nice looking furnishings to work with, or, for a home that is vacant? Do you teach staging along with restaging? If I would be interested in staging vacant homes for realtors, do you teach ways to obtain furnishings without having to buy and store them? That is one obstacle that I haven't been able to figure out. I've been a real estate agent for 12 years, so, I am hoping that being in this industry could be a help for me in selling staging/restaging services to other agents. I would like to start doing this part-time along with real estate, and if I could build this business up enough, eventually go into this full time." ANSWER - I cannot ever predict what someone could make in a business venture and it would be unethical for me to do so. I can tell you that there are people in the industry making extremely good income and there are those that make no income. None of that means anything, because your experience will not be like anyone else's. I believe we do include the answers to your questions in the training. It is excellent and very thorough. Please take time to read the list of topics in the salesletter. We do cover how to handle vacant homes. I have found that it is not that crucial how "nice" a client's furnishings are. What is important is where they are put and how beautiful and sparkling you have made the dwelling. If you follow the training, there is no reason why you can't be as successful as your dedication brings. We have the training - but you are the X factor. This is an honest answer, though probably not quite what you are hoping for. I have personally found that life gives you back, in most cases, who you give out. Sometimes the best decisions you make are to just say, "I'm going to do this, no one is going to stop me, end of story". Our training is very affordable - don't take those high priced seminars or home study courses that are full of fluff and fillers or that are over the top expensive, where they try to convince you that you can't be successful without them or in a hands-on class environment! It's totally unnecessary and rather foolish, if you ask me. Don't get fooled into believing you have to belong to their pricey organizations or become licensed by them at the tune of $6500 per year. That's pure nonsense! I've never fallen for that stuff and you shouldn't either. I've made it so incredibly easy to break into the lucrative home staging industry, you owe it to yourself to check out my various programs and options. Choose from the links below for more information.